Birthday Cakes for Men in Brisbane & Gold Coast. Cake Ideas for Men. Need a unique guy’s cake? Mens birthday cakes can look great too. Delivery available to Brisbane north side, Brisbane south side and other areas in Brisbane and the Gold Coast. All my cake designs are original, designed and decorated by me. Every cake is finished to the quality you see here. Because I focus on my own cake designs I do not take orders for copies of other peoples cakes or novelty or character cakes. Why don’t you see full pictures of my cakes? I am a cake designer and spend many hours developing and creating unique and beautiful cake designs for my clients. To protect my designs (from others who might want to copy) and keep them special for clients I don’t display full pictures of my cakes. 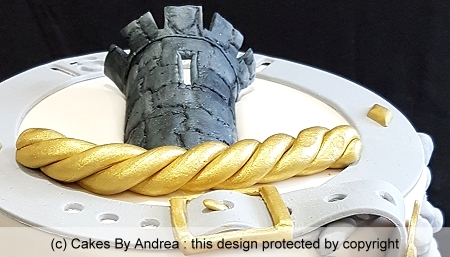 I am happy to discuss the full range of design options with clients and welcome enquiries from those who want a quality cake to mark their special occasion. Call me or request a callback to discuss your cake. Birthday cake for guys featuring filled martini glasses with hand-made sugar paste tuxedo and bow tie (100% edible). Themed birthday cake featuring hand-made clay target shooting elements (100% sugar paste) on multi-level plaques with large sugar paste age plate featuring contrasting paint spray effect. Set on double fondant covered boards with inscription. All decorations are custom made by hand and are edible. Travel-themed mens birthday cake featuring Vesper handmade from sugar paste (100% edible), oversize age number in colours of Italy, Colosseum facade and other elements custom designed to suit the recipient. Decorations all handmade, edible, and arranged on fondant covered cake set on themed fondant covered board. 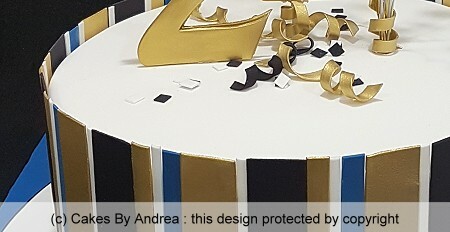 Stylish mens birthday cake featuring gold, black, blue and white stripes around cake, large gold age number and other decorations all hand made from sugar paste and 100% edible. Mens birthday cake featuring handmade army sniper character in camouflage uniform with camouflage tarp among bushes and rocks, with large glossy camouflage age number. All decorations are made by hand and are 100% edible. 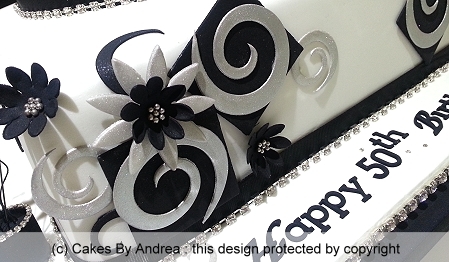 Birthday cake featuring geometric swirl design and stylised blossoms with birthday inscription on fondant covered board, finished with combination of black and diamante ribbons. Birthday cake featuring Mexican theme with hand made sugar paste sombrero, chilli and cactus with blossoms (all 100% edible) on blue fondant cake and fondant-covered board. Elaborate birthday cake featuring entirely hand-made sugar paste mini grand piano and studded stool. Piano set on scroll design plaque with diamante trim. Men’s birthday cake featuring handmade sugar paste photo frame with birth year plaque (showing travel picture), wine bottle, and bunches of grapes, set on white fondant covered cake. Modern birthday cake for men featuring black, silver and white striped sugar paste panels finished with sugar paste twirls, confetti, and inscription on fondant covered board. Suitable for any age. Fun carved fire engine birthday cake (yes this is for an adult) covered in red fondant with all vehicle components and accessories hand made from sugar past and 100% edible. 21st birthday cake for guys featuring handmade 3D reproduction of family crest tattoo. All decorations handmade and coloured based on drawing from client. White fondant cake with extra decoration on fondant-covered board. Two-tier birthday cake featuring red, yellow and white stripes (hand made from sugar paste) with inscription on fondant covered board. Celebration cake suitable for men featuring a stack of assorted books (each one a separate cake) fully finished with detailed fondant covers, realistic pages, some with aged effects, and words on book spine to suit customers theme. Set on a gold fondant covered board. Masculine birthday cake featuring special items for client including his own car, assorted mechanics tools, car components, all handmade from sugar paste. Red fondant covered cake set on white fondant covered board. To see many more cake designs visit the Design Range page.